GORGEOUS SKIRT FROM TALBOTS. GREAT LOOKING. Givenchy Straight Skirt. skirt weighs 294 g. unwrapped. elastic at the waist at each side. 100% Cotton. Plus Size 22W. front & back kick pleat. darted front. GORGEOUS SKIRT FROM CLASSIQUES FOR NORDSTROM. Long kick pleats front and back. Beautiful condition, no moth holes. Great addition to a modern wardrobe. Leather button. Made in U.S.A. Pockets on both sides. FABRIC CONTENT-- 100% Wool. I will be glad to help. Length: (waist to hem) 29". NORDSTROMS Tailored GORGEOUS Vintage 80's Soft Pink LONG Pleated wool Skirt 30"
GORGEOUS SKIRT BY DON CARLOS. Size: US 6 - 26" waist, 31" long. GORGEOUS SKIRT BY CAROLE LITTLE. GORGEOUS SKIRT BY HORST BASLER. German Size = 40; US size 10. hidden back zipper. Vintage Calvin Klein Glen Plaid Women's Proffessional Skirt Size 10. Preowned in excellent like new condition. Great for the office or professional who wants style. Color-black/ white/ red glen plaid. Front and back center bottom to mid skirt pleats. Side adjustable waist buttons. Front button and zipper. Measurements- Waist- 31in. Hip-39in. Length-33in. Check out pictures. Authentic Murray Dress Tartan. GORGEOUS SKIRT BY PENDLETON. Waist to Hem: 26". Waist Size: Back seam to back seam 13 1/4". Evan-Picone label from 1970s. Three side pleats on the left side. Hip Size: Back seam to back seam 19 1/2". BEAUTIFUL WELL-TAILORED SKIRT FROM DONCASTER. Elastic on the sides of the back of the waistband. 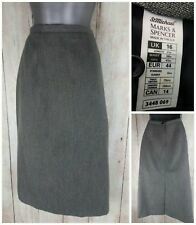 Adorable and lengthening/slimming skirt from Prophecy's Power Dressing Division / Partner Linens Collection in the 1980's. Faux wrap skirt with front flap design with totally sewn together on both side seams for appropriate ladies when they cross their legs. Style: TULIP SHAPE SHORT SKIRT WITH HIGH WAIST FULLY LINED. CAN BE DRESSED UP OR DOWN FOR CAREER OR PLAY. A MUST HAVE BASIC CLASSIC FOR ANY WARDROBE! Label: CACHE. Color: IVORY; WHITE; LINEN WHITE. Care Instructions on Label: DRY CLEAN ONLY. GORGEOUS SKIRT FROM L.L. BEAN. Vtg plaid wool lined Landsend mid calf size 12. Vtg black wool lined pleated mid calf size 10. GORGEOUS SKIRT FROM ROBERTO VERINNO for El Corte Ingles. One owner! Vtg plaid wool nylon unlined skirt size 12. length 32".mid calf. Laura Ashley tartan vintage lined skirt in excellent condition . From a smoke free home . Size in label UK 14 EUR 42. Size in label :UK 18 Short EUR 46-48. Size in label UK 16 US 12 F46 D42. Size in label UK 14 petite. Marks and Spencer navy check fitted skirt, not stretch, lined, back zip, back kick split. Size in label UK 14 EUR 42. 55% Wool 25% Polyester 20% Other. This is an original early 1990s skirt, super smart! It says size 10, but I think it will fit a size 8 or a small 10. The length is below knees and I am 5 ft 6 in. The skirt is lined and the outer material has heavy, linen style look. Size in label UK 18 30". Leaving Balenciaga in 1964 for a brief stint with Courreges, Ungaro then opened his own couture house, with only six other workers in 1965. Ungaro was at first known for his crisp space age tailoring which appealed primarily to the young. 100% Linen, fully Lined Vent in Back.